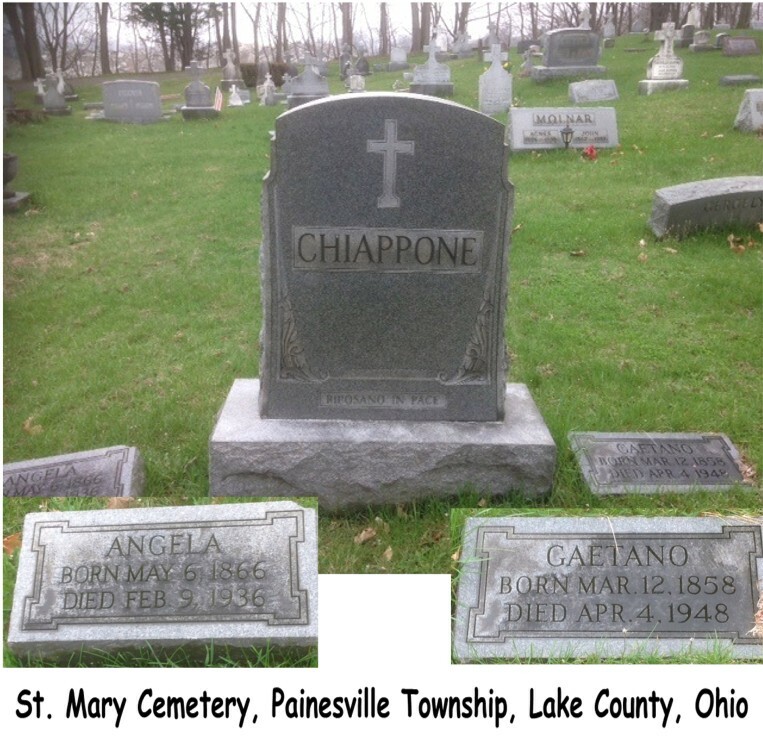 Gaetano Chiappone first appears in the Painesville, Ohio, area between 1906 and 1912. In America, Gaetano Chiappone was known as Thomas Chiappone. Gaetano Chiappone, son of Ignazio Chiappone and Lucia Nicosia, was born on March 12, 1858, at Montemaggiore Belsito, Sicily. He married Angelina Pecoraro, daughter of Egidio Pecoraro and Carmella Bortina, about 1890, at Sicily. Gaetano died on April 4, 1948, at Lake County Memorial Hospital, Painesville, Lake County, Ohio, at age 90. His body was interred at St. Mary Cemetery at Painesville Township, Lake County, Ohio. 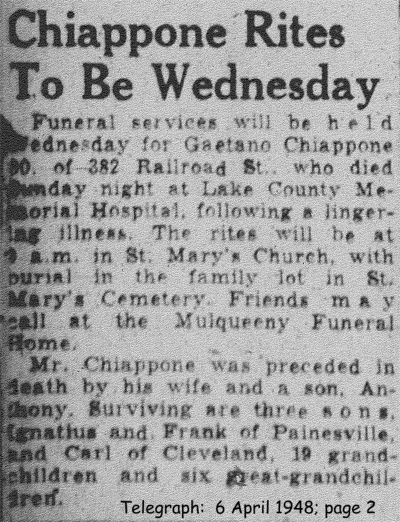 Gaetano Chiappone immigrated to the United States on November 18, 1906, at age 48. He was travelling to Buffalo, New York, to join his brother, Gaspare Chiappone. Gaetano is shown as re-entering the United States on June 25, 1912. He was returning to Painesville, Ohio, re-joining his son, Ignazio Chiappone. Gaetano’s wife and sons, Francesco and Carmello, joined him in Painesville in April, 1913. 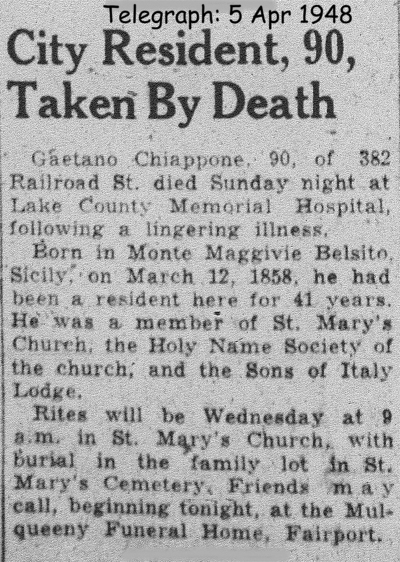 At the time of death, Gaetano resided at 382 Railroad Street, Painesville, Lake County, Ohio. 1. Ignazio Chiappone was born on December 20, 1892. He married Francesca Dolce, daughter of Filippo Dolce and Rosalina Nasca, in 1916. Ignazio died on June 8, 1964, at 336 Owego Street, Painesville, Lake County, Ohio, at age 71 of a heart attack. His body was interred at Riverside Cemetery at Painesville, Lake County, Ohio. 2. Antonio Angelo Chiappone was born on February 19, 1899. He married Agata Guccione, daughter of Salvatore Guccione, in 1923 at Italy. Antonio Angelo died on January 5, 1941, at Lake County Memorial Hospital, Painesville, Lake County, Ohio, at age 41 of pneumonia. 3. Francesco Chiappone was born on April 2, 1903. He married Carmella C. Pace, daughter of Calogero Pace and Santina Cicero, on May 26, 1924 at St Mary Catholic Church, Painesville, Lake County, Ohio. Francesco died on October 7, 1954, at Lake County Memorial Hospital, Painesville, Lake County, Ohio, at age 51 of a cerebral hemorrhage. His body was interred at Riverside Cemetery at Painesville, Lake County, Ohio. 4. Carmello Chiappone was born on August 29, 1906. He married Angeline Catalano, daughter of Liborio Catalano and Epifania Pace, about February, 1930, at Cuyahoga County, Ohio. Carmello died on September 4, 1993, at age 87.